THE POSSESSED (Spooked Television Releasing) October 2008 DVD. Produced and Directed by The Booth Brothers. This shocking, documentary from “epic reality” filmmakers the Booth Brothers (Spooked, Children of the Grave (as seen on Sci Fi Channel) will be released October 2008 on DVD. ” The Possessed ” is a paranormal investigation into the twisted world of possession. Cases include the chilling true story, ‘ The Watseka Wonder ‘ (1877), America’s first documented spiritual possession of a 13-year-old girl from the small town of Watseka who became possessed by spirits of the insane dead. While exploring an old Insane Asylum in St. Louis, the filmmakers then investigate the real 1949 Exorcist’s diary, the true story behind the motion picture “The Exorcist”. 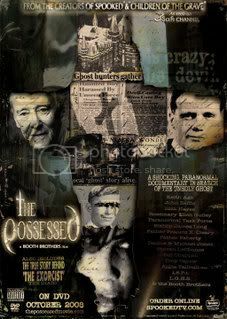 In depth, ” The Possessed ” is a terrifying look at modern day possession and it’s evidence, ” Demon Entities Do Exist ” ! Scheduled to air on the Sci Fi Channel next summer, ” The Possessed ” will be released, UNCUT and UNRATED on DVD in October, 2008. Utilizing the latest in paranormal research technology and an army of paranormal professionals, the Booth Brothers search for the scariest entity known to man, “The Unholy Ghost”. Filmed on location in the actual haunted houses, churches and asylums where the events took place. Exclusive Interviews with Father Francis X. Cleary and Father Faherty, the last remaining priests of the most infamous 1949, St. Louis exorcism. Paranormal cast; Keith Age, John Zaffis, Rick Hayes, Rosemary Ellen Guiley, Paranormal Task Force, Bishop James Long, Denice & Michael Jones, Steven LaChance, Bill Chappell, Troy Taylor, Anita Tallbull, I.S.P.I., L.G.H.S. & the Booth Brothers. This entry was posted on Thursday, August 28th, 2008 at 5:44 am and is filed under Stories. You can follow any responses to this entry through the RSS 2.0 feed. You can leave a response, or trackback from your own site.